Adobe Captivate is one of the best authoring tools available to eLearning professionals. In this tutorial, we show you how to publish SCORM content in Adobe Captivate so you can import it to your LMS. 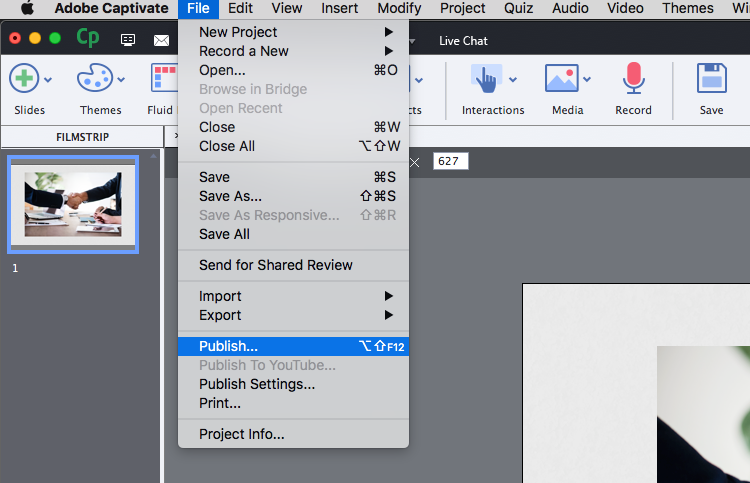 Adobe Captivate makes publishing eLearning content as a SCORM file simple. All the background work is taken care of, such as packaging the SCORM. But there are still a few important settings you need to consider. This guide shows you how to choose the right settings for publishing SCORM content in Captivate so you can import it to your learning management system (LMS). We'll publish content as SCORM version 1.2. This is the version that is compatible with LearnUpon LMS. Depending on the version of Captivate you use there may be slight changes to the interface. Three versions are available to eLearning pros: Captivate 8, Captivate 9 and Captivate 2017. The latest release adds new features including better responsive design, the ability to convert legacy content as responsive projects and more font options than ever. It also removes the ability to publish flash content as flash is now dead. To begin, click “Adobe captivate”, and select “Preferences” which is the final option on the menu. In “Preferences” you will see some options. For this Adobe Captivate guide we will focus on the reporting options. This is where we set the information that we want the SCORM file to send back to LearnUpon. To Start, click on the “Reporting” option located under the “Quiz” header (see the screenshot below). At the top of the Preferences box, you' ll see a checkbox for “Quiz, Enable reporting for this project”. You'll need to tick this option to use this SCORM with LearnUpon. Standard: The version your SCORM file will be published in. LearnUpon uses SCORM version 1.2. Choose this option from the drop-down menu. Incomplete - Complete: For a SCORM which does not contain an exam. Once a learner meets the SCORM success completion criteria, they're marked as complete. This option will not report any scores back to LearnUpon. Incomplete - Passed/Failed: Should be used when the SCORM contains an exam. This will then also get the SCORM to report back to LearnUpon the scores obtained and whether a user passes or fails the included exam. To determine whether a user passes or fails, please ensure you have a mastery passing score set on the SCORM. Success Completion Criteria: This section denotes how a user should be deemed as having completed the SCORM course. User Access: The user can complete by simply accessing the course and/or the Quiz if you have one. You can choose how many of your slides they need to access by editing the Slide Views. You can edit the percentage of slides or refine it to a certain number of slides before they are marked Complete. We would recommend that if using User Access, you choose that the learner views 100% of your slides (see the screenshot below). Slide View and/Or Quiz: Choose that a learner is set to complete when they view your slides AND/OR when they have passed the Quiz. If you choose Quiz and “Quiz is Passed”/”Quiz is passed, or the Quiz attempt limit is reached” from the drop-down, you should also choose the Status Representation of Incomplete - Pass/Fail (see the screenshot below). Data to Report: This section tells sending data back to LearnUpon. Quiz Score: There are two options, percentage or points format. Interaction Data: Send details of any interactions your user makes with the SCORM back to LearnUpon such as the total time spent on the course. We recommend using this setting. You'll find Quiz settings located in the preferences box. Review the scoring, slide duration and styling options before moving on to the publishing stage. When you have finished applying these settings you are ready to Publish your course. To Publish your SCORM, from “File” go to “Publish”. We now have a few options to consider (see the screenshot below). Publish as: Publish a SCORM for use on a browser (e.g. Internet Explorer, Firefox, Chrome or Safari) we will always use the SWF/HTML5 output. Location: This is the location which you would like to store your file. Browse to the location where you would like it saved. Zip File/ Publish to Folder: The zip is the file type that you upload into your LMS. Check the box beside “ZIP file”. Output Format: Here you can choose to publish your SCORM as Flash (SWF), or HTML5, or both. If you publish to Flash (SWF), your learners can view the course on their desktop computers. If you publish to HTML5, your learners can view the course on iPads and mobile devices. If you publish to both SWF and HTML5, the learner can view the course on desktop computers, iPads, and mobile devices (The 2017 version features only an option of HTML for output). Full Screen: This opens the file in full-screen mode. You can’t apply this option if you select SCORM options for the project so leave this setting unticked. Export PDF: The file generated is inserted into a PDF file and then published. Use this to share content over email or any other means. For example, where a learner doesn't have access to the content through the Flash Player in a browser. Scalable HTML Content: Enabling this option will resize the SCORM to the size of your user's browser window while keeping it in proportion. Seamless Tabbing: Allows users to seamlessly tab through Flash content, and browser controls. This option is applicable only for Internet Explorer. The Project Information area displays useful statistics about the project including the size (resolution), number of slides, audio information, e-learning details, accessibility compliance, and the playback control assigned to the project. To change any of the options listed in this area, click the blue text. You can access this by pressing “More”. Click “Publish” (see the screenshot below). You have now successfully published your SCORM and are ready to upload to LearnUpon. All you have to do is add a SCORM module to your course in LearnUpon by simply browsing for, and selecting your newly published SCORM zip file. LearnUpon takes care of everything else!